A Riding Hat is technically an equestrian helmet based on the classic hunt cap. A Riding Hat has a hard shell on the outside of an impact-resistant resin or plastic, traditionally covered with velvet cloth. 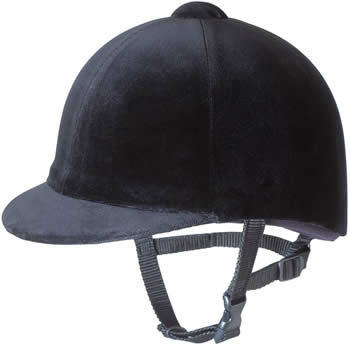 The brim is particularly flexible and will give way immediately in the event a rider lands on it. Beneath the shell are materials designed to absorb the impact of a fall or blow. The inside is lined and often padded in order to be comfortable for the rider. Ventilation is usually worked into the design, and a harness is attached to keep the helmet on the head at all times. A classic hunt cap which modern helmets attempt to resemble offered little or no protection to the rider of the horse. Neither do other types of hats popular with riders, including the derby, cowboy hat and the top hat.